It is dual-purpose, but arguably better for culinary purposes. (For dessert purposes, Opal, which is related, is probably better). 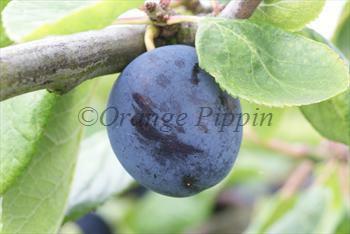 Please fill in the details below and we will let you know when Rivers' Early Prolific plum trees are back in stock. Rivers' Early Prolific is in flowering group 2. Rivers' Early Prolific is self-fertile and does not need a pollination partner, although fruiting may be improved if there is a compatible tree of a different variety nearby. Rivers' Early Prolific is unusual for a plum tree in that it grows with a slightly "pendulous" habit - somewhat reminscent of an upright weeping willow. The trunk will eventually reach the normal proportions but the branches and twigs always stay disproportionately thin. Cropping potential is often greater than the branches can bear, so thinning of the fruit and/or branch supports may be necessary. Like some of its offspring (e.g. Czar) Rivers' Early Prolific can also tolerate shade. Somewhat counter-intuitively, whilst Rivers's Early Prolific crops heavily, it is not a vigorous tree, and tends to be small or average size. Rivers' Early Prolific was raised by the famous Thomas Rivers nursery in Hertfordshire, UK, in the 1830s. It was developed from an early-season French plum variety called Precoce de Tours. It was grown commercially in the UK for a period, and has also been used to breed a number of other popular plum varieties, including Czar.